First released in 2007 at a special function hosted by PAHAR and Mountain Shepherds, this one-of-a-kind 36″ by 23″ interpretive historical-cultural map of Uttarakhand can be viewed below. Mountain Shepherds also maintains a stock of prints at its office. 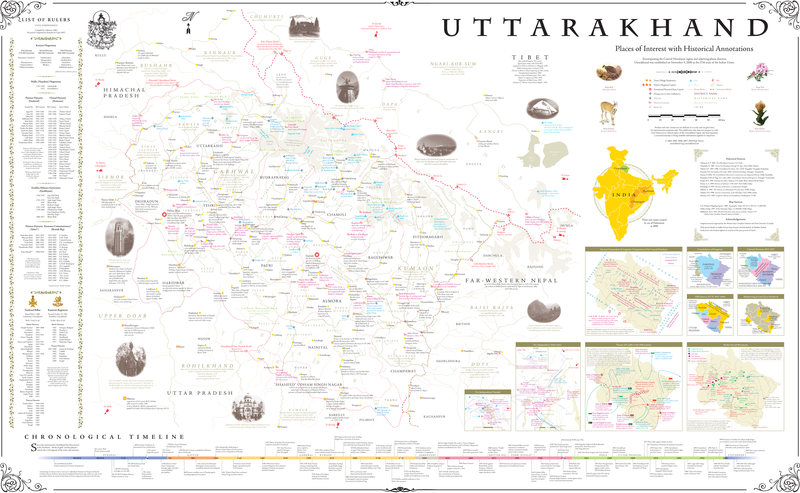 The map includes an expanded legend, references, list of rulers, historical timeline, and inset maps of various territorial, cultural, & historical facets of Uttarakhand. The 2010 edition has replaced the increasingly lengthy list of UP and Uttarakhand chief ministers with the battle honours of the Garhwal Rifles and Kumaon Regiment.